This is an updated product combining my grocery and take-out words products. It has been added to the bundles of products listed below. If you have previously purchased any of the bundles below, you can download this for free. 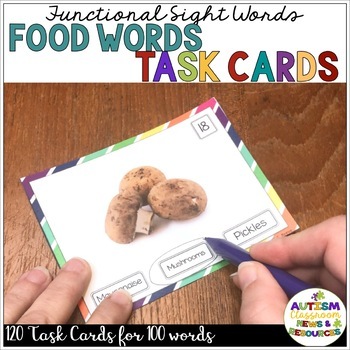 This set of functional sight word task cards are great for functional life skills curricula. 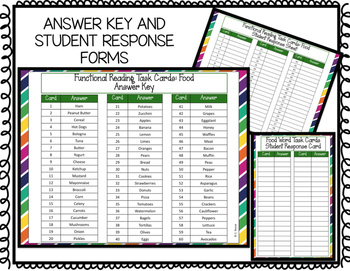 It includes 120 multiple-choice task cards with real photos using multiple choice for identifying sight words related to food items. The cards can be used with or without an environmental print curriculum. They are not associated with any formal curriculum. The words are words that would commonly be found on grocery lists, flyers, restaurant menus and take out boards. 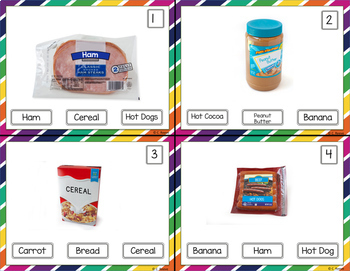 All the task cards include real photos of the food items. Download the preview for a list of the words included. Reading Functional Sight Words Task Cards Bundle (Special Ed; Autism}. Structured Work System Secondary Starter Bundle Life Skills Kit and Tasks. Canadian Structured Work System Secondary Starter Bundle: Life Skills - Autism. The cards are numbered, and answer sheets and key are included. With the multiple choice cards students can use dry-erase markers to circle the answer and are not required to write the answers. Students who are unable to circle could dab the answers with a marker or use a clothespin or paperclip to mark the answer. If you wish, you can also have the students write the answers on the answer sheet and use the choices as a word bank. Customer Tips:If you have any questions or concerns about this product or things you would like to see changed, please contact me at my email in the product or in the preview and I’ll be happy to discuss it. 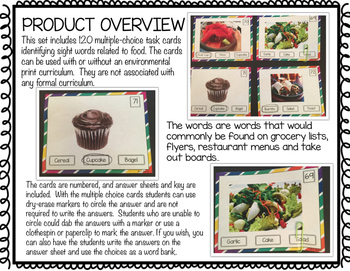 This product is copyrighted to Christine Reeve 2015 for use in one classroom. They may not be copied for additional classes without purchasing extra licenses. For bulk discounts, please email me at autismclassroomnews@gmail.com.